The Federal Government's $1.2 billion plan to lift the wages of aged care workers from July is in danger of collapsing. This is due to employer dissatisfaction with an increased role for unions, and frustration that the package falls short of the Productivity Commission's recommendations for aged care reform. The ageing of the population will require the size of the notoriously underpaid workforce to treble by 2050, and the Labor Government is offering to contribute towards pay rises above the award wage. But the industry is unhappy with the condition that employers sign up to enterprise bargaining agreements, which is deemed necessary to ensure that employers do not pocket the funds. An industry body argues that the plan discriminates against the 65 per cent of the aged-care sector that are small and standalone providers, with nearly half the large Catholic component of the sector unlikely to sign up. But inaction that leads to failure to reach an agreement to secure the earmarked funds amounts to discrimination against one of the most vulnerable groups of the population. What is often regarded as 'basic' nursing care is actually a demanding and complex role, dependent upon both an often unrecognised level of skill and discretion on the part of the worker. As Sydney University health educator Professor Mary Chiarella argues, these workers are invariably the ones who make or break the dignity of a person in aged care, by how sensitively they choose to perform their role. Despite what those who don't do this work might think, it is not basic — it is extremely psychologically complex. Cleaning patients who are soiled with excreta, blood, or vomitus, who feel ashamed of themselves for being 'dirty' or for 'losing control, and restoring both their hygiene and their sense of self worth in the process, requires the highest order of skill. Chiarella describes much of what nurses do as 'invisible', performing the most private of functions for a patient, such as washing genitalia. Nurses do things which have the potential to strip patients of their dignity, but most of the time they choose to enhance it. Managing sensitive issues to do with the body is not given the same status as a psychiatrist handling sensitive issues of the mind, because it is considered 'dirty' menial or domestic work. As is the case in many workplaces, there is an important link between pay and performance. If the workers are treated with dignity, they are more likely to treat the patients with dignity, which is what aged care is all about. It's time to step up negotiations. Wage increases for aged care workers should not be allowed to become yet another laudable but failed Gillard Government initiative that an incoming Coalition government refuses to countenance because of its stated commitment to fiscal responsibility. The dignity of older Australians is not expendable. Michael Mullins is editor of Eureka Street. 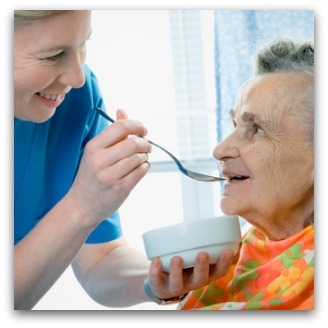 Aged care worker image by Shutterstock. Aged care reform is one of those issues many financially interested parties wish would go away. I see it as a weathervane showing our decency or otherwise as a society. Strange how, as we as a nation get wealthier, family cohesion and social integrity break down. Not a good augury and something we need desperately to do something about. Good article, Michael. 'The dignity of older Australians is not expendable.' Thank you, Michael; I love the message, I love the article, and I love the headline. As a 40-something whose parents are starting to plan their entry into a retirement home, this issue has struck a nerve with me of late. The description of 'senior' as it pertains to citizens has seemingly been synonymous with 'disposable' for several decades now. Wage justice would serve as a step towards enshrining dignity for elderly Australians and, as Michael writes, if 'the workers are treated with dignity, they are more likely to treat the patients with dignity, which is what aged care is all about'. As the baby boomer bulge goes through the ageing services, the main issue will be residential care, and then granny dumping. Sadly for many people, its the mind which deteriorates, and carers give up when cleaning the house of feces becomes too much. As well as paying the carers, they need to be erecting facilities as there is already a long waiting list. However, as its our biggest social denial, I doubt it will happen until it is at catastrophic proportions. Great article. Thank you for pointing out the skill, sensitivity and intelligence required in aged care. Done well it is wonderful and life-affirming; done badly it can lead to physical deterioration, depression, despair and early death. As a registered nurse (retired) with many years experience in aged care, the thing that gets me going is the very well paid and underworked "upper class" strata within aged care paid for by the direct care workers. There was a time when aged care providers received funding part of which had to be spent on carers (education)and this had to be accounted for or paid back. Then accreditation came and this system was scrapped as the accreditation system would uncover the unscrupulous care provider. Having participated in this sometimes farcical accreditation process and with stories coming out of aged care of neglect and substandard care, something needs shaking up and it's not the aged care worker, viewed by management in terms of their work out put e.g. number of showers completed and mouths fed. I feel ashamed that I have written that but it from my experience reflects what is going on. Interestingly a catholic aged care provider in my state has just added a new role to the hierarchy to ensure corporate values (ideas on paper) are achieved. Have they ever considered these corporate values in relation to that person who daily attends the needs of the resident who is referred to as the client? I am an optimist. I also love AFL. In the great game of life, and this is where my optimism comes in, we are heading towards a life span of 100 years.By not smoking, not drinking alcohol, not socialising indiscrimatedly, walking wherever and whenever I can, and going to church regularly, I have survived the first three quarters in reasonably good health and spirits. But two years into the last quarter, where the game of life can be won or lost,I am beginning to feel apprehension. The "What if...?" questions suddenly pop into my head. What if I have an accident and join one of the most vulnerable groups of the population - the aged who cannot look after themselves? I would want my carers to be skilled and dedicated and if that meass they deserve better pay and conditions then give it to them. All this talk of not being able to do something because of a commitment to fiscal responsibilty indicates to me a commitment to placating the interests of high finance before those of the most vulnerable in society. But then the latter have little influence politically, do they? Compelling argument! Catholic Health Care has been least helpful, and very 'light on' with time allocated to domestic assistance - less than half available from other providers, Most providers take their carers very much for granted, in terms of travelling time between clients, lack of payment for fuel, and wide apart distances they expect them to cover. Wages minimal. Enterprise agreements should be mandatory. So many carers really care, and deserve recogntion and support for this. Politicians and admin. personnel will not share worries 'ordinary' clients face when they need care. Bumper retirement plans for them! My mother died recently at 92. For many years she'd been cared for in her own home by her children, but she'd had periods in care after falls etc, which gave us the opportunity to see the huge gaps between the stated goals of the various nursing homes and the actual service that was carried out. It seemed to be it was all about staffing levels and the structures of supervision within the organization. The patients who did best were the people who had family with the time to come in at every meal to feed them and make sure the small but essential details were taken care of. Your article, Michael, is very important and we all need to do what we can to keep the issue front and centre. Perhaps it is time for Catholic Bishops to take a step up. If the Church can find the money to meet the abuse settlements, then they could also use these resources, which are obviousy there, to fund the fair payment of workers in their Health Care Sector. They may also be able to lead the way and give an example that shows that meaness isn't expected in this sector. Why not raise some tax from Business and the Community. This is an issue for all Australians. Thank you Michael.As a nurse I know the dedication and care provided by primary aged care workers is excellent,and mostly given in very stressful, under resourced settings. Dignity is a word often heard and documented, but cultural change is necessary for a holistic approach and this is unrecognised by management.While care and dignity is 'managed' by profit -driven owners the elderly and frail can only seen as 'products'.Education in health care and qualifications must be mandatory for ALL personnel. This extremely sensitive work is very rewarding but I have left this sector because I could not keep long unpaid hours just to complete all documentation. Often I had 50 residents to administer medications and wound care, oversee all nutritional, environmental safety,GP and pharmacy reviews,family,filing complete medical histories records, phone and security issues in Low care settings, with Ageing in Place, while very high levels of care were needed.Dementia is also always impossible to manage in these settings.If someone had a fall (very common) I would prioritise time to monitor vital signs, document a full report, inform Dr,family,pharmacy,and possibly send to hospital. Legally, implications of Duty of Care concerned me and my nursing registration was at risk of being compromised. Nurses carry enormous responsibility and they have no legal protection if they choose to work with unsafe practices. as a daughter who helped nurse her mother overseas for four years with my dad. it is a very hard row to hoe. the last few weeks of mum"s life we had carers and home nurses this was in England to help us special bed etc. in the family home for which we were very grateful for. dad had to pay a certain amount for when mum was in emergency respite until all the bed was available and the carers four times per day. any way aged care is a very serious need and more money aught to be found Im sure politicians wont mind a wage reduction and may be a levy from the time a person starts work say 5% of wages in a separate account not to be touch by politians of any persuasion would be an idea. young folk forget that one day they will be old. we seniors cannot rely on our children as our parents can on us. may be because I, am of Polish extraction and my father expected me to look after mum. and now him. feel sure other nationalities do the same. single or widowed daughters who have grown children are expected to care for their elderly frail parents no buts about it. I agree wholeheartedly with the comments expressed in this article. Neither the dignity of older Australians or the Care Workers is expendable. I totally agree, Michael. I hope that you can use whatever influence that you have with the Catholic sector to grasp the realities of the service that these workers provide and to act accordingly. I have the same experience as Joan Seymour and Catherine in relation to my mother in law and a brother in law. Understaffing is a real problem and relatives needed to be there to help. Having seen what happens in this situation, I would rather die a couple of years earlier in my own home, if at all possible, rather than spend 2 years in "care". Good article. As well as bodily matters there are other very sensitive issues around which low paid workers interact daily with the (not always old) residents in aged care accommodation, eg talking of family, loss of general health and 'freedom', and sometimes other quite profound things. The lifting (even with machines) takes its toll on the aged care workers' backs and careers. The workers are responsible if a resident falls, or for health implications resulting from inattentiveness on their part, unlike other better paid workers such as shop assistants (who don't have to undertake a course to qualify to be able to do their work). Some aged care homes are staffed principally by migrant women with dependent families, relieved to be working, and vulnerable to exploitation by employers because they don't know basic workforce rights and processes in Australia. Its a challenging time for the elderly, often without decent food, stimulation etc, without the workers who attend to their most basic needs being treated poorly by employers. Thanks for a very important and sensitive article. Aged care workers are very important to us older Australians. Productivity tradeoffs should not be part of wage negotiations for workers in that industry. Our family was able to get my ageing father in a such a facility, we were lucky that he was sharp as a tack until he died of a heartattack at 79. We will always be grateful to the people who looked after him. Maybe politicians should look at themselves with productivity in mind some of them will never hold a job in the real world that we ordinary citizens live in. Good article and good comments. Very important subject. Congratulations. Arrive at the door of the nursing home to visit Mum only to find that the place is quarantined because of a gastro outbreak. Now let your imagination do the rest. If we are serious about a preferential option for the poor - staff and residents - then this matter needs a just solution. Yes, aged care workers are undervalued, because we allow it to continue. People are reluctant to rock the boat for fear of reprisals from management, of whom most in aged care are vicious bullies, albeit it often in a very subtle way. It is always the workers at the front line who are underpaid and treated as expendable 'material'. Even the term personal has been replaced by 'human resources', as if we were just lumps of material to be exploited, used up and then thrown in the rubbish. The people who have never worked 'on the floor' or haven't for a long time, have no right to make decisions over the heads of frontline staff like AINs. These people are the backbone of the industry and are treated as non-entities by management. Open your mouth, upset the apple cart and watch out. Be happy and positive all the time or you will be shadowed by some pimp appointed by management and eventually winkled out of the organisation or at least, given a very stern warning. The residents, of course, have to put up with lack of stimulation, disgusting food and being hoodwinked by the profiteers. As for the 'non-profit' providers, they can still afford cars for their management staff, six figure salaries and other fringe benefits. Think about it. ...the dignity of the workers also!! The vast majority of whom are women. Of course. I work in Home and Community care. I love helping my clients in any way possible and seeing that I can enhance their life by treating them with compassion, dignity and respect. I am very well qualified (even hold a degree) however I will probably end up leaving this profession due to the terrible pay and conditions. I am not paid for time driving in between clients and not reimbursed for any car expenses (apart from petrol). My hours can be slashed without notice as clients move into nursing homes or hospital. Many times I greet a client who has been crying and are distressed so I see my job as one where it is complex and you need to be sensitive and caring as they are so vulnerable. I'll be sad to leave this profession but we do need to be treated better and be able to live on what we earn. The problems in aged care are long standing and nobody is really interested in fixing them, let alone paying care workers a living wage. I have now worked in aged care for over 13 years and have seen no improvement to working conditions in that time. However, I have observed good intentions being mismanaged and reduced to profit those at the top, whilst the workers at the bottom are still treated like lowly, rubbish. We are bullied with policies and procedures that pray on the fact many employees in this industry do not speak much English. Not only are care staff poorly paid, they often have to forego breaks and work extra time to get their work done, a fact that management is always keen to not mention of rebuff by coming up with the 'better organize your work load' mantra to make this issue go away. Now staff are required to undertake training courses in their spare time and with no. Recently the organization that I work for has changed from paper pay advices to computerized ones. There was no consultation with staff about this, nor was anyone offered a choice. Furthermore, our paper pay advices showed leave entitlements and accrual, which have been omitted from the computerized pay advices. Many aged care workers work in hostels, many of which were designed around clientele that still had independence and only required minimal assistance.Through ageing in place many hostels have now become nursing homes, but because of their designation they are not required to provide the same level staffing levels and resources as do proper nursing homes. Many times one staff member is required to look after three or four high care clients among 15 other clients of varying need and functioning levels. The lay out of many hostels is not at all suited to high care delivery, which is another fact that is ignored by management and aged care bodies. Care staff have few protections and even less opportunities for recourse. This industry hires mainly people from Asia with very poor language skills, who are desperate to work and this industry exploits that weakness. Instead of reform there is paper shuffling, policies and procedures, but very little in terms of actual improvements. I love my job, but I absolutely hate the industry and am looking to get out, taking my 13 years of experience with me to be replaced with someone with a certificate, poor language skill and no real commitment to the work they do. When my parents require care they will never allow them to go into aged care and I already have an exit strategy for myself should I ever require to be cared for by others. Our aged care system is broken and nobody wants to fix it.